Michael "Dread At The Controls" Campbell started in the 1970's as the first Reggae Radio DJ for Jamaican Radio. You can listen to it, when you visit the site: MIKEYDREAD.com contains an MP3 File with a sample from one of his early Radio shows (RIGHT-CLICK TO DOWNLOAD), introduced by Mikey himself. More history can be found at the site, as Mikey Dread talks about his works with Punk-Rock band The Clash (RIGHT-CLICK TO DOWNLOAD), among many more things. 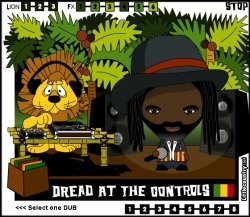 MIKEYDREAD.com, therefore, should not remain unvisited by anyone who (claims to) love (DUB) Reggae Music. History, Niceness, Music, everything is there and presented in a way that is worthy of the one and only REAL MIKEY DREAD.